Pope Francis declared the two men saints, along with five lesser-known figures from Italy, Germany and Spain. Pope Paul was a contentious figure, who guided the Church through the turbulent social changes of the 1960s. 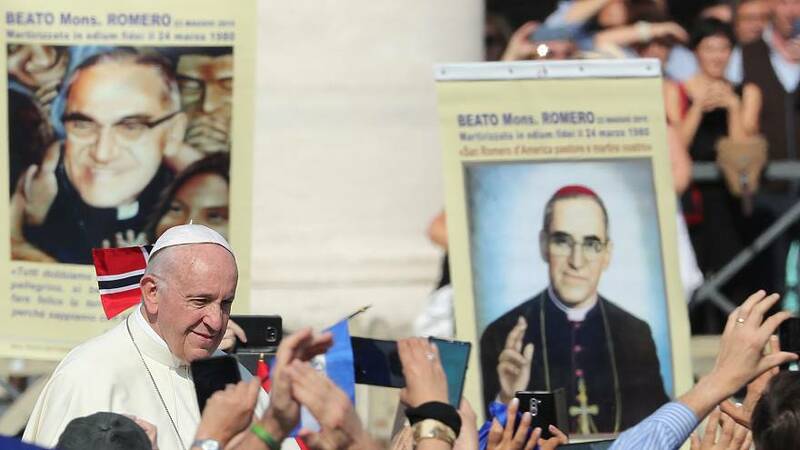 Romero was killed by a right-wing death squad while saying Mass in 1980 and is a hero to many. "He was a martyr, he is a martyr of the Salvadoran people.'' one Salvadoran woman in the crowd said. ''He fought for good against evil and for the people, for everyone." Romero consistently denounced violence by both sides in El Salvador’s civil war. As a mark of respect, Pope Francis wore the blood-stained rope belt worn by Archbishop Romero when he was murdered and used the chalice and pastoral staff of Pope Paul VI.